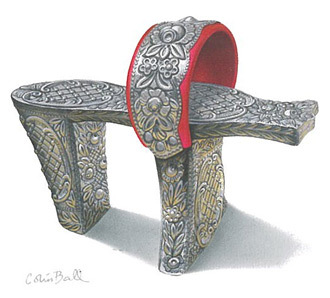 Stilted woodens sandals named Kab-Kab, usually inlaid with mother of pearl, were commonly worn by women throughout the Ottoman Empire. The ones with simple carved decorations and smooth leather upper straps were worn in the Hamam, a public bath house. Those with more elaborate decorations were worn socially and for special occasions. Young brides wore kab-kabs purposely high to raise the girls to the height of their husbands. The one shown here was worn by a bride in Istanbul in the 19th century and is made of wood covered with intricately embossed silver. The leather strap is wrapped in red velvet.